activities. Among the area's most appealing natural wonders are the hot springs at Lakeview and Summer Lake. Since they were developed as resorts and therapeutic sanitaria in the early part of the century, these historic landmarks have attracted visitors from all over the world. Hunter's Hot Springs lies just outside Lakeview on Highway 395. 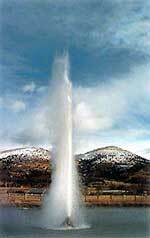 When the site was developed in the 1920's, three geysers were struck. One of them, "Old Perpetual," still spouts hot water to a height of over fifty feet every ninety seconds. It's the only active geyser in the far west, and the pond surrounding it features blue fish that have adapted to life in hot water. In addition to its natural fountain, Hunter's Hot Springs has a motel and a large hot pool open to the sky. 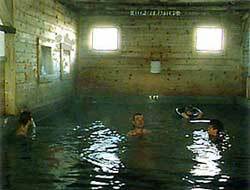 Thirty miles northwest of Lakeview on Highway 31, Summer Lake Hot Springs have been attracting visitors since 1928. A rusticenclosure houses a large hot pool, and a campground offers RV and tent campsites. Guests can also stay in fully furnished vintage Airstream trailers. Both Hunter's and Summer Lake Hot Springs have recently acquired new owners, and improvements are planned at both establishments. If you're thinking about visiting, it's worth a call to find out what's new.